Jim Davidson selected Bob to appear on his BBC-1 variety show filmed at London’s Cambridge Theatre. Apart from Jim himself others on the bill included Bryan Ferry, Ronan Keating, Status Quo and Jethro. He was also a regular on BBC- 1 with Sir Terry Wogan on “Aunties Sporting Bloomers” and also appeared on the Olympics edition. 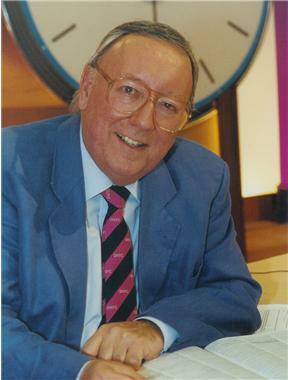 Bob is also a frequent guest on Channel 4’s “Countdown” and often worked with Richard Whiteley and Carol Vorderman. These days he has even branched out into interviewing. In his own humorous style – teasing but without losing respect – his recent interview with Sir John Major was such a success that they are doing it again. He has recently been on Sky interviewing Alan Shearer and Wolves manager Mick McCarthy. In 2010 the Duke of Edinburgh even wrote a one-verse poem about Bob (see blog) and the start of 2011 saw him Down Under entertaining Aussie audiences ranging from a lunch with former Prime Minister, John Howard, to functions out in the country districts. He's going back again in 2012. Among his other interviewees one with Sir Alex Ferguson drew praise from the Mail on Sunday as the best interview they had ever seen with the world’s top football manager. He has also appeared with, Steve Harmison, Michael Vaughan and, on Sky, Alan Shearer, Mick McCarthy, Peter Shilton, Bryan Robson, Steve Bruce and Harry Redknapp. Apart from Sky Sports, hosted Radio 5’s” Six O Six Show” and has featured in a whole range of other programmes including Radio 4’s “Today”. He is often asked to appear on news and current affairs programmes talking about sport, after-dinner speaking and speech-writing. He featured strongly in a Radio 4 series analysing oratory.